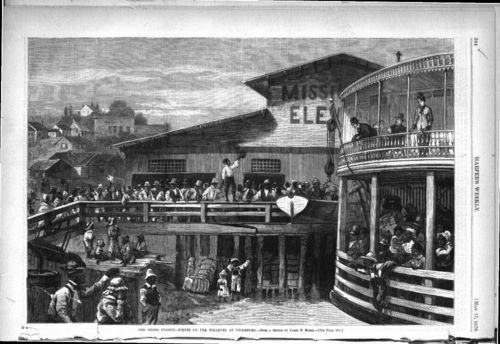 This drawing, from an original by James H. Moser, depicts a large gathering of African-American refugees congregating around a steamboat docked at Vicksburg, Mississippi. It was published in the national magazine Harper's Weekly. This drawing demonstrates the number of black Southerners willing to emigrate to the North (quite a few are crowded onto the dock). Also, it works with a variety of documents, including the photograph of the emigrants leaving Nashville (students could compare and contrast the two images).